We’re on the threshold of an arrival. Are we waiting with eager expectation or indifference? Although external temperatures might be low, are we being warmed on the inside by the thought of Christ’s immanence with us? Will we greet Jesus with joy? Or might we ignore Him, like a sideshow we don’t have time for as we busy ourselves with preparations? It’s possible to press our noses close to the manger, be captivated by the Nativity, yet miss the wonder of the infant Incarnate Christ within. Will we allow our cold, wintry hearts to become warmed by the love of God? I hope so. Because He desires our heart’s devotion above all things and longs for us to open the door to Him. I am like most of you: knee-deep in extra busyness, weary while waiting and exhausted by the preparation. But as I pause to ponder just what we are about to celebrate and Who this feast is really about, I see how easy it can be to slide into secularism and neglect the most important thing. Maybe, as we wrap presents, ready ourselves to exchange gifts and attend to last-minute activities, we can try to focus our attention on recognising the presence of God in our midst. Because He breathes out His beauty every day. He is ready to rule and reign, starting with one surrendered heart at a time. Jesus is the Gift. Jesus is all we ever truly need. I have taken an imaginary winter walk in the sonnet below. Come join me? Together we can discover grace being showered on us liberally like snow from heaven above, thawing out our chilled, distracted hearts. While air swirls breath into a misted fog and fingertips freeze. But these wintry sights enliven a chilled environment. And sprinkle shining stardust by angelic intent. 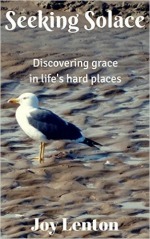 Initiating a thaw within, making way for God’s grace. Whereby space is created to believe and receive. And a blessed and peace-filled Christmas to you, dear Joy❣️ Thank you for sharing this! I am thinking of you and your beloved and thanking God above for all the above. Merry Christmas, dear Joy. And blessed respite in the days running up to the New Year. Running up? No. Strike that. In the days of warming up for the New Year’s unfolding . . .
Dear Bettie, I am sure a heart as hungry as yours is to seek wonder in the everyday and discover the beauty of God’s presence will not come away disappointed or unsatisfied. God always responds to those eager to hear and receive from Him in the minutiae of their lives. I see that unselfish LOVE pouring out of you, sweet friend. It’s clearly evident in the way you act toward others. And I feel greatly blessed to be within its orbit! Merry Christmas to you and yours and all JOY in 2018!